A new paper published in Advances in Space Research finds correlations between short-term changes in the solar wind over the solar rotation period of ~27 days and certain meteorological phenomena, including cold fronts, precipitation, and temperature. "This research is based on the assumption that every ejection of magnetic field energy and particles from the Sun (also known as Solar wind) has direct effects on the Earth’s weather. The impact of coronal holes and active regions on cold air advection (cold fronts, precipitation, and temperature decrease on the surface and higher layers) in the Belgrade region (Serbia) was analyzed. Some active regions and coronal holes appear to be in a geo-effective position nearly every 27 days, which is the duration of a solar rotation. 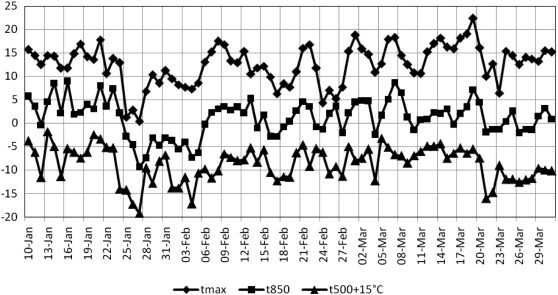 A similar period of repetitiveness (27–29 days) of the passage of the cold front, and maximum and minimum temperatures measured at surface and at levels of 850 and 500 hPa were detected. We found that 10–12 days after Solar wind velocity starts significantly increasing, we could expect the passage of a cold front. After eight days, the maximum temperatures in the Belgrade region are measured, and it was found that their minimum values appear after 12–16 days. The maximum amount of precipitation occurs 14 days after Solar wind is observed." The paper joins many others describing potential solar amplification mechanisms, whereby tiny changes in solar magnetic activity may have large-scale effects on weather and climate. In this paper we research the relationship between solar activity and the weather on Earth. This research is based on the assumption that every ejection of magnetic field energy and particles from the Sun (also known as Solar wind) has direct effects on the Earth’s weather. The impact of coronal holes and active regions on cold air advection (cold fronts, precipitation, and temperature decrease on the surface and higher layers) in the Belgrade region (Serbia) was analyzed. Some active regions and coronal holes appear to be in a geo-effective position nearly every 27 days, which is the duration of a solar rotation. A similar period of repetitiveness (27–29 days) of the passage of the cold front, and maximum and minimum temperatures measured at surface and at levels of 850 and 500 hPa were detected. We found that 10–12 days after Solar wind velocity starts significantly increasing, we could expect the passage of a cold front. After eight days, the maximum temperatures in the Belgrade region are measured, and it was found that their minimum values appear after 12–16 days. The maximum amount of precipitation occurs 14 days after Solar wind is observed. A recurring period of nearly 27 days of different phases of development for hurricanes Katrina, Rita and Wilma was found. 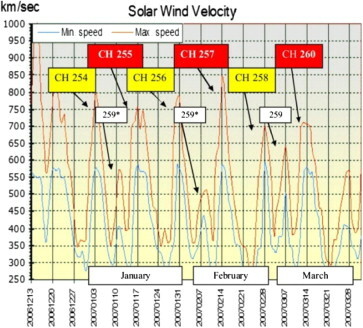 This analysis confirmed that the intervals of time between two occurrences of some particular meteorological parameter correlate well with Solar wind and A index.